Immigrants from across the world call Iowa home. 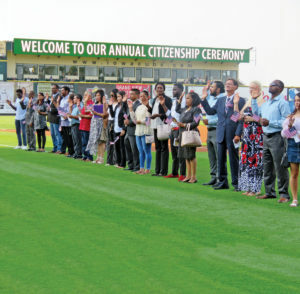 People from around the globe are sworn in as citizens of the United States at a ceremony held at Principal Field. For many, the road to citizenship took years to travel. Photo courtesy of the Iowa Cubs. They come from all walks of life and from all corners of the globe. Aksana Barodka first saw the United States in 1994 as part of a summer exchange program that brought a group of teens from Belarus to New Hampton. Lalnghak Sanga wanted to escape a poor, war-torn country and a government that shut down the education program he tried to create for students. Mike Sylvester’s family brought him to Iowa as a teenager when his mom’s company transferred her. Katarina Reeves was a travel-hungry young woman with only $200, a suitcase of summer clothing, and hopes of a new life. They were all immigrants to the United States, specifically Iowa, where they wanted to make a new home. Now, each has completed the steps and requirements necessary to officially call America home as a U.S. citizen. More immigrants arrive in the U.S. each year than anywhere else in the world. It is a nation that was built by immigrants, says Lori Chesser, an immigration attorney with Davis Brown Law Firm in Des Moines. Almost 1.2 million people received lawful permanent residence, were admitted as temporary nonimmigrants, were granted asylum or refugee status or were naturalized in 2016, the most recent complete year for which statistics are available from U.S. Citizenship and Immigration Services. Almost 5,300 of those were in Iowa. Of the petitions filed in 2016, about 86,000 were denied. Tens of thousands more wait to be processed and finalized. The number of petitions that are filed and the number of applications approved increases almost every year. During the first quarter of 2018, USCIS has received 218,248 applications for naturalization. It has approved 174,248 applications and denied 22,599 while 747,383 remain pending. The USCIS reports it takes about 11 months after applying for citizenship to be sworn in and $725 to fill out the citizenship form and go through the naturalization process. Those interviewed for this article say it takes much longer, can cost much more and that there is simply no option for some who want to become citizens. Chesser says a simple immigration case where one spouse is already a U.S. citizen can cost $5,000. A complicated case that takes years could cost tens of thousands of dollars. While cost is prohibitive for some, Chesser says she rarely has a client say the process is too expensive and thinks the government filing fees are reasonable. There are waivers for those who prove they are unable to afford the fees, and there are attorneys who conduct pro-bono immigration work. Refugees often receive assistance from religious or aid organizations. The United States requires foreign citizens to obtain a U.S. visa before entering the country. Certain international travelers are not required to have a visa if they meet specific requirements. Travel visas are issued for those who are in the country on a temporary basis, and immigrant visas are issued to those who want to live in the United States permanently. A foreign citizen who wants to immigrate generally needs to be sponsored by a U.S. citizen, a lawful permanent resident who is an immediate relative, or a prospective U.S. employer. Each must have an approved petition before applying for their visa, according to the U.S. Department of State. The United States limits the number of immigrant visas that are issued to foreign naturals who want to become lawful permanent citizens each year fromChina, India, Mexico and the Philippines, under the Immigration and Nationality Act. The Department of State allocates immigrant visas. Family-sponsored visas are limited to 226,000 per year, and employment-based visas are limited to 140,000 a year. These limits can be exceeded when certain visas from the previous year’s allocation were not used. There are other categories in which visas also are issued. When the demand is higher than the supply, whether per year, category or country, a waiting list is created for prospective immigrants. Each month, the Department of State releases its Visa Bulletin, which details the status of visas in the United States and the dates of applications that are being processed. Some are still being processed for the Philippines from 1995. Carlos Vaquerano, and her American parents, Ron and Martie Diddy. The biggest challenges most immigrants face are the lengthy wait, the lack of available visas and other permanent residency statuses, and inability to meet qualifications, says Megan Lantz, an immigration attorney with Barten Law P.C. in Ames and Des Moines. • Be sponsored by an immediate family member who is already a U.S. citizen or a permanent lawful resident. • Receive a job offer or have the potential to perform a job that can’t be done by a U.S. citizen, although wage protection and other restrictions apply. • Claim asylum or refugee status. “I think our immigration system is too narrow for the jobs we have available,” Chesser says, noting that temporary visas should be added for additional jobs. Each of the routes to temporary or permanent residency is highly regulated and subject to limits and eligibility regulations, according to the American Immigration Council. 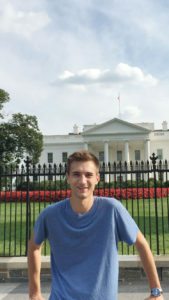 Mike Sylvester at the White House on a trip to Washington D.C. Sylvester immigrated to the United States from Canada as a teenager. He recently passed his citizenship test and is waiting to take his Oath of Allegiance. A visa allows a foreign citizen to stay in the United States for a set period of time. It’s also the first step on the path to becoming a U.S. citizen for most. • Must be an immediate or close relative of a U.S. citizen. • Must meet employment requirements, such as have an extraordinary ability in science, art, education, business or athletics; be an outstanding professor or researcher or a multinational manager or executive; or be in a profession that requires an advanced degree; among others. • Green Cards are available for other categories that include religious workers, members of the international media, refugees or those seeking asylum, victims of human trafficking or another crime, and those from countries with relevant agreements with the U.S. government. A limited number of Green Cards are also available through the Diversity Visa program that allows people from countries with low rates of immigration to come to the United States. These applicants must have a high school education and two years of job experience. Once a foreign citizen has his or her permanent resident card or Green Card, he or she now has proof of being authorized to live and work in the United States. They can apply for a Social Security Card and a state-issued driver’s license. Green Cards are valid for a set period of time and then need to be renewed. They are good for readmission to the United States after a trip abroad as long as the individual does not leave for more than a year. Immigrants who want to move on from permanent lawful residency to citizenship have to wait a set period of time: three years for those who are married to a U.S. citizen or five years for all other applicants. For those who do not fit into one of the three main visa categories, specifically the family-sponsored visa, there is no way for them to apply, Lantz says. For those who do have family in the United States, she’s seen wait periods of two years for spouses and 20 years for siblings. She says people become desperate, which is why some attempt to come into the country permanently before they are allowed, and that they are not aware of all of the requirements to establish permanent residency. If an individual has come to the United States without previous permission, it can lengthen the process and create additional steps to take. It took Aksana Barodka 23 years from the time she first stepped foot on American soil until she was naturalized at the July 3 ceremony in Des Moines. Her employer, formerly Alliance Technologies and now Aureon, applied for all of her work visas and helped her through the Green Card process. She estimates the company spent between $30,000 and $35,000 during the time it took for her to become a citizen. The process by which Barodka received her work visa no longer exists. Barodka’s American family, as well as her employer’s senior management team, was critical in helping her through the process. At one point, she was required to return to her home country to complete required paperwork. When she prepared to return to the United States, the U.S. Embassy in Belarus did not want to grant her re-entry even though she had all of the appropriate legal papers. life in America. Barodka was at a loss. Her American family, Ron and Martie Diddy, called upon then-U.S. Sen. Tom Harkin to intervene, so Barodka was able to return. USCIS provides testing information, but there are also multiple citizenship classes that are offered throughout the Des Moines area. Some community colleges, immigrant organizations and churches offer free citizenship classes. Once the individual has met all of the requirements and agrees to take an Oath of Allegiance, a naturalization ceremony will be scheduled in which the person takes the oath in a public ceremony, and the new citizen receives his or her Certificate of Naturalization. Barodka says she considered immigrating to Canada or even a European country at one time because the process was taking too long and there were many hurdles. “I thought: ‘OK, I have all of this education that this country doesn’t want that came from this country, what can I do?’ ” she recalls. 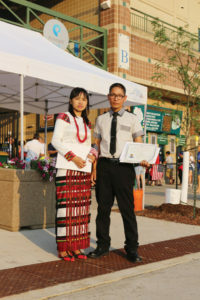 Lalnghak Sanga of Burma/Myanmar and his wife outside the Iowa Cubs stadium after Sanga received his citizenship certificate in July. The majority of applicants come from Asian countries, according to USCIS. About 462,300 individuals from Asia were granted permanent lawful residence in 2016. Lantz is fluent in Spanish, so many of her clients called Mexico, El Salvador, Honduras and Guatemala home. Others are from Africa or South America. “The No. 1 reason (for immigration) is economic conditions and violence in their home country,” Lantz says. Once members of a family come to the United States, the others oftentimes follow. Chesser says many of the people she works with to obtain lawful residency want to contribute; they’ve gone to school and realize they have something to offer. Some immigrants move to the United States because there are fewer barriers to them starting their own business or they want to live in a place where society is more accepting of women. “I’ve certainly had people move here so their daughters can have a career,” she says. Barodka came back to the United States after her initial visit to be part of the senior class at New Hampton High School. Her first few months in the United States were a big culture shock. She spoke British English with a Russian accent. Her knowledge of how the world worked came from Soviet-taught classrooms. Each night, the Diddy family would sit down with her to do homework and explain subjects such as free economy, U.S. government and American history. She graduated from high school and wanted to stay, so she attended a community college and later earned her bachelor’s degree. As Barodka set out in her professional career, she met her now husband, Carlos Vaquerano, who emigrated from El Salvador in 2000 after the country suffered two large earthquakes. He is in the United States on a temporary protected status visa. The couple has started to apply for his citizenship now that Barodka is a citizen. They were married in 2005 and have two daughters, Anya and Sonya. Barodka says even though she had most rights as a Green Card-holder, one was missing: her right to vote. Barodka says she sleeps better at night now that she is a U.S. citizen. She was also pleasantly surprised, at her naturalization ceremony on July 3, to hear U.S. District Judge Robert Pratt, who gave the oath, encourage the new residents to remember their home countries. “I was touched by the fact that, us as individuals who have decided to become part of a different country, (were) strongly encouraged to not forget our roots. That’s what makes this country what it is,” she says. The next day, as other Americans celebrated the nation’s birth, Barodka says she finally understood. Mike Sylvester emigrated from Toronto, Canada, in 2009, when he was 14, through an L-2 visa. His mother received a job transfer to Iowa. Sylvester’s family eventually returned to Canada, but he decided to stay and attend the University of Iowa after graduation. He was drawn to the university’s law school. He had an interest in political science and wanted to live in hub of political activity. His L-2 visa status continued until he received his Green Card in 2012. After the five-year waiting period, he applied for naturalization in late 2017. He had his interview in August 2018 and passed his naturalization test. Now, he awaits the schedule of his Oath of Allegiance. Sylvester says he could have continued to renew his Green Card, but he wanted the flexibility to move between the United States and Canada if his job changed. He also wanted to be able to vote in U.S. elections and will cast his first ballot in November. While the Sylvester family had an easier time receiving their visas and Mike his Green Card because of his mother’s work, he says it was still an arduous process. He spent more than $1,000 on legal fees and the citizenship application. He recommends using an attorney to anyone who wants to obtain permanent residency or apply for citizenship. Sylvester says his career in the United States — he works as an account coordinator for LS2group in Des Moines — would have been different in Canada. His parents are surprised at the responsibility he has and the access he has to high-ranking political officials, which would not have happened if he were performing similar work in Canada. Even when Sylvester was younger, he says he had more available to him. He was involved in debate and mock trial teams and played competitive sports. Lalnghak Sanga’s journey to the United States began many years ago when his name was Lalpianvula Khupno. “Since long time ago, I decided to change my name whenever I become a citizen of my new country,” he explains. His new name means one who lives in a higher place. “My God brought me to a higher place from a poor country to a rich country,” he says. Sanga grew up in Burma, also known as Myanmar. When he left, there were no rules, no laws and no rights for citizens. Military leaders dictated what happened. They did what they wanted without care to others. The education system suffered. People had no money to buy meat. Sanga taught in a government school for two years before he started a private boarding school in 2005. He says the government learned his students were better educated than those at the government school and forced him to stop operating his boarding school. He immigrated to Malaysia. Years later, he applied for refugee status with the U.S. government. Three years later, he was able to immigrate to the United States. After he lived in the United States for five years, he was eligible to apply to become a U.S. citizen. 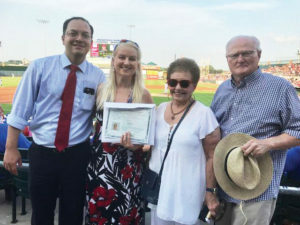 Sanga waited a decade to officially become a citizen, which happened on July 3, when he was sworn in during the nationalization ceremony at the Iowa Cubs game. During that time, he paid his registration fees but had few costs. Katarina Reeves emigrated from the Czech Republic in 2000. “I was hungry to travel and meet people and meet other cultures,” she says. Reeves, who now lives in Van Meter, was 19 at the time and received a J-1 Visa to work as an au pair for a family with three children. Her visa was good for a 12-month stay in the United States with a one-month extension to travel. Reeves left the Czech Republic with one suitcase of summer clothes — the winter ones wouldn’t fit — and two $100 bills. “I was leaving everything: my family, my two brothers, all of my friends,” she says. About four months into the program, the host family informed Reeves they no longer had a need for an au pair. Reeves felt her hopes crush. She was already attending Des Moines Area Community College and had purchased the books she needed for her classes. Reeves moved in with a friend, Shon, and the two later married. The couple had their first child about 18 months ago, a boy named Gabriel. Katarina didn’t work after her au pair job fell through until she received an official work permit after she and Shon were married. She received her Green Card shortly thereafter and waited the required time period before applying for citizenship. She estimates it cost her family $7,500 during the six years of waiting. “I wasn’t going to do it illegally,” she says. Reeves became a U.S. citizen in 2006. As someone whose company benefitted greatly from Aksana’s skills and professionalism, I thank her, Alliance, and Aureon for their perseverance and commitment. She is an excellent example of how the USA is strengthened by its willingness to welcome people in need of a new home.